As we all know, anytime is a good time to eat chocolate, but the summer months lend themselves so well to fresh fruity flavours. Luckily, we have some luxury confections to fill that chocolate shaped gap when the sun shines. Handmade and hand enrobed in the beautiful Market town of Bakewell, nestling in the rolling hills of the Peak District, our creations are made with passion, care and only the very finest ingredients sourced locally & around the world. If you love fresh British strawberries in summer, our Strawberry and Marc de Champagne Popping Candy Truffles are the perfect tempting treat. The deliciously different truffles are enrobed in the finest pink, milk and dark chocolate then sprinkled with popping candy. A deliciously fun and fizzy delight – and a great treat to enjoy with a glass of Champers when watching Wimbledon. In celebration of the world famous British tennis tournament, Holdsworth Chocolates is offering 20% off the Strawberry and Marc de Champagne Popping Candy Truffles (115g) until Sunday 15th July, making them just £7.20 a box (exclusively on our website). 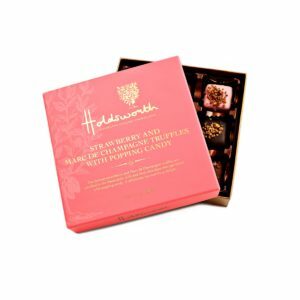 For another classic summer treat, why not try Holdsworth Chocolates’ English Fruit Creams? The delightfully soft cream centres are infused with natural English fruit flavours – apple & blackcurrant, strawberry cream & raspberry cream – and enrobed in the finest milk, dark and white chocolate. The beautifully flavoured creams have developed a real following over the years, becoming a firm favourite with chocolate lovers throughout Britain. Last but not least, Holdsworth’s Milk Chocolate Orange Truffles are a delicious citrusy treat that can be enjoyed all year round – and they are especially lovely in the sunshine! The handmade ganache truffles are delicately infused with a natural orange oil to create a classic combination. Shop online or come and visit our factory shop in beautiful Bakewell!